the art of mindful eating : Am I Hungry for Food? The 7 types of Hunger. Am I Hungry for Food? The 7 types of Hunger. Stress changes our relationships with food. Elevated stress hormone cortisol levels lead to overeating , craving certain types of foods as fats and carbohydrates and weight gain. Many times when under chronic stress we cant distinguish between real hunger and stress-induced hunger, which leads to emotional eating. 3. Mouth hunger - how much does your mouth want the food or beverage? 4. Stomach hunger - is your stomach full? empty? does your stomach want food? 6. Mind hunger - "shoulds" or "musts." What does your mind tell you about the food or beverage? 7. Heart hunger - is the food comforting? soothing? For this exercise you will need a single raisin. Other foods will also work, such as a dried cranberry, a single strawberry, a cherry tomato, or an unusual type of cracker. 1. Begin by sitting quietly and assessing your baseline hunger: How hungry are you, on a scale of zero to ten? Where do you "look" in your body to decide how hungry you are? 2. 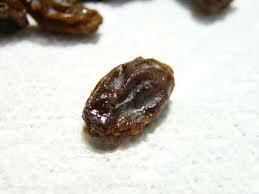 Place the raisin (or other food item) on your palm. You are going to investigate it with the only tools you have, your five senses. You have no idea what this object is. You have never seen it before. 3. Eye hunger First you investigate this object with your eyes. Look at its color, shape, and surface texture. Now rate your eye hunger for this item. On a scale of zero to ten, how much hunger do you have for this object based upon what your eyes see? 4. Nose hunger Now you investigate it with your nose. Smell it, refresh the nise, and sniff it again. Now rate the nose hunger. On a scale of zero to ten, how much hunger do you have for this item based upon what your nose smells? 5. Mouth hunger Now you investigate this object with your mouth. Place it in your mouth but do not bite it. You can roll it around and explore it with the tongue. What do you notice? Now you can bite this object, but only once. After biting it once, roll it around again in the mouth and explore it with the tongue. What do you notice? Now rate mouth hunger. On a scale of zero to ten, how much hunger do you have for this object based upon what the mouth tastes and feels? In other words, how much does the mouth want to experience more of it? 6. Stomach hunger Now you decide to eat this object. You chew it slowly, noticing the changes in the mouth in texture and taste. You swallow it. You notice whether there are still any bits in the mouth. What does the tongue do when you have finished eating it? How long can you detect the flavor? Now rate stomach hunger. Is the stomach full or not, satisfied or not? On a scale of zero to ten, rate stomach hunger. In other words, how much does the stomach want more of this food? 7. Cellular hunger Become aware of this food passing into the body. Absorption begins as soon as we begin chewing. Are there any sensations that tell you that this food is being absorbed? How is it being received by the cells in the body? Now rate cellular hunger. On a scale of zero to ten, how much would the cells like to have more of this food? 8. Mind hunger Can you hear what the mind is saying about this food? (Hint: Often the mind talks in "shoulds" or "should nots.") Now rate mind hunger. On a scale of zero to ten, how much would the mind like you to have more of this food? 9. Heart hunger Is the heart saying anything about this food? On a scale of zero to ten, how soothing or comforting is it? Would the heart like you to have more of this food? You might like to repeat this exercise with liquid. Pick a drink you have never had before, such as an exotic fruit juice. Take your time and assess each kind of thirst separately.